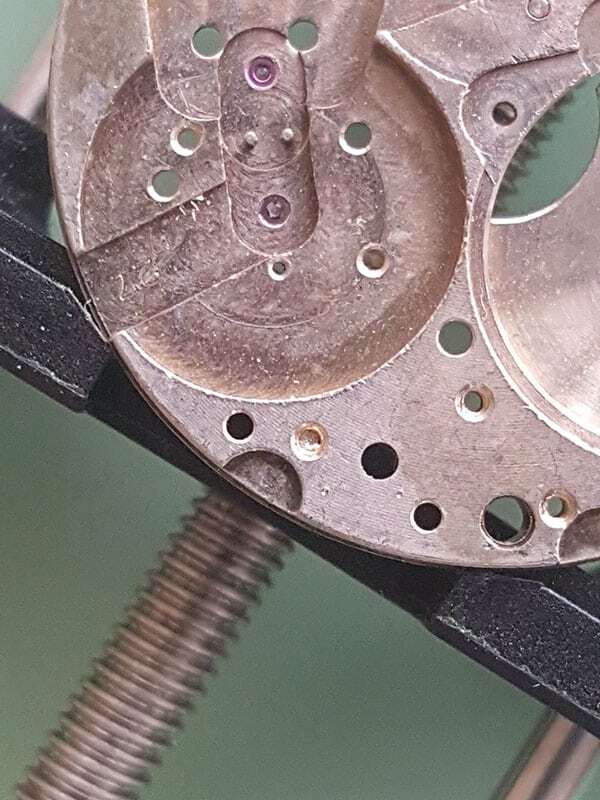 Have you ever had a watch movement with a broken screw? Or an original signed crown (case parts are often harder to find than movement parts) with a piece of a broken winding stem inside? Sure, you could use a drill to drill out the broken screw or use a screw extractor. However, not everybody has access to these tools. I don’t, for example, because I don’t often need them and they’re expensive. But I have some good news. There’s a trick to remove a broken screw without using special tools. How do you remove a broken screw? Take your jar and fill it with some water. Mix as much alum powder with the water as it will hold. I suppose you could buy a block of alum and grind it but I bought a container of alum powder of the internet. Before you continue, make sure to remove as many parts as possible. Alum won’t corrode stainless steel but it’ll corrode carbon steel. For example, if the broken screw is inside the baseplate, make sure to remove parts like the set lever screw. Please note that some crowns are also made of carbon steel so the alum will ruin them. So, make sure you know which metal the crown is made of if you need to remove a broken winding stem from a crown. This might help: stainless steel has a luster and carbon steel is quite dull. Also, carbon steel is magnetic and stainless steel isn’t. Plunge the part with the broken screw in the alum solution and leave it for about a day. Remove the part from the solution and examine it. The alum solution should have corroded the top layer of the broken screw. Scratch the corroded metal with the mending needle and remove it with some Rodico or peg wood. You’ll have to rinse and repeat because each time you’ll only remove the corroded top layer of the screw. But no worries, it will be completely gone in a couple of times. Make sure to carefully dry the baseplate or part you’ve been working on because the solution is water based. I always clean the part in the watch cleaning machine and dry the part in the heating chamber. Carry on with the repairs like the broken screw never happened! Do you have some tips for broken screws? Please leave them in the comments below.